The Book of Deer is one of Scotland’s most important manuscripts. It is a small (54mm x 107mm) Gospel Book, now housed in Cambridge University Library. Before c. 1100 it was apparently in the possession of the early Columban monastery at Old Deer in north-east Aberdeenshire. This monastery has otherwise left no trace of its existence. A Cistercian Abbey was founded nearby in 1219. The Book of Deer came into the ownership of Cambridge University Library in 1715, when the library of the Bishop of Ely and Norwich was presented to the former by George I. Before that, the Book of Deer may have been in the possession of Dr Gale, High master of St Paul’s School (1672-97). The stages by which it moved from the North East of Scotland to the South of England are by no means clear. Even Cambridge University Library was unaware of its significance until it was ‘discovered’ in 1860 by the then librarian, Henry Bradshaw. More information and images are available on The Book of Deer web page. 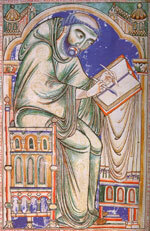 The oldest extant source for Kentigern is the fragmentary Life of Saint Kentigern. This life consists of a preface and eight chapters. 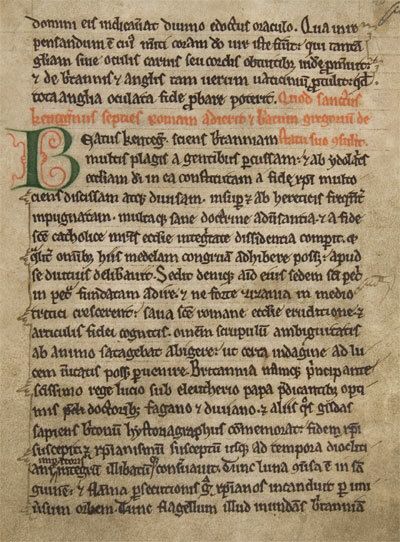 The author is only describes himself as a cleric of St. Kentigern who had travelled a great deal, and the preface states that the life was composed at the request of Herbert, bishop of Glasgow from 1147 to 1164. The anonymous author said that he found his material for the Life of Saint Kentigern in a little book of his miracles and from oral tradition. This fragmentary life was used at Glasgow for about 30 years. At that time a new life was written by Jocelyn, a monk of Furness Abbey in northern Lancashire. This life was written at the request of Bishop Jocelyn, who was Bishop of Glasgow from 1175 to 1199. Jocelyn, the author, was at Down in Ireland in 1185, and so it is likely that he wrote his Life of Saint Kentigern sometime before then, perhaps about 1180. Jocelyn also states that he used a little book, written in the Scottic style, as a source for his life, as well as the life already at Glasgow and oral tradition. Approximately 300 years ago, a copy of the original manuscript was acquired by Archbishop Marsh of Dublin and it was held safely in that library until two years ago when the book was scanned and used to create four new copies of the ancient hagiography. Thus, after 400 years the story of the life of St. Kentigern has returned to Glasgow, Scotland. A page of that manuscript is shown below.